Upcoming Exhibition: "Socko! The Thrill of Art!" Inside Angles, a custom framing gallery in Holland Ohio, will be hosting a show of Carolyn's art opening the 12th of April and running through the 18th of May this year (2013). The show will be significant, with more than 40 of Carolyn's pieces on display, and they will also be available for purchase. Inside Angles Custom Framing Gallery, located at 6831 Angola Rd. in Holland OH (map), 419-867-3533, will feature Carolyn Ellingson in an exhibit, beginning April 12 until May 18. "Socko! The Thrill of Art" will include dozens of monotype prints, intaglio prints, and paintings produced by Ellingson in San Francisco during the '80s, '90s, and early '00s. The art is dominated by bold compositions of vivid color in a non-representational form, and serves as a reminder of her courageously creative approach to life. Ellingson was taken by mesothelioma in 2002, but her artistic vision can be viewed for the first time since her passing, and for the first time in the Toledo area, this month. The public is invited to attend the opening reception on Friday, April 12, from 6pm to 8pm. The Toledo Blade has a nice write-up of the exhibit. Subscribers to our newsletters may recall that a Las Vegas collector was selling 2 of Carolyn's paintings under some hardship. Artgroove.com was able to step in and re-purchase the pieces from the owner, and we are thrilled to have them back in our collection. 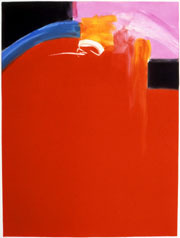 The 2 pieces are Cerulean Blue Painting, II (seen here) and Red, Pink and Blue, II. We are still planning on listing a handful of Carolyn's pieces for sale via eBay. Watch this space. There are some impending changes to make the Artgroove.com Gallery a bit easier to browse and search. 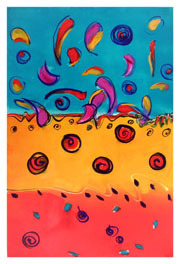 We are considering beginning to offer the ability to purchase and checkout (via PayPal) Carolyn's art via the website. Packing/shipping costs will necessarily be imprecise, but any over-charge will be refunded to the buyer once the real cost is determined. Requests, questions, suggestions? Please contact us, or you can simply reply to this email. We appreciate all feedback, especially on our future plans!